West Coast Pedal Board, the industry leader in customized pedal boards and cases, wanted a website that was as attractive and functional as their boards. Emerger Media developed a custom website that properly reflected the artistic approach West Coast Pedal Board takes in all its work. 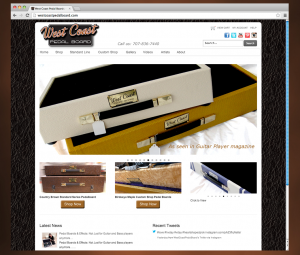 We also developed an integrated eCommerce solution that has helped West Coast Pedal Board to increase product sales. At West Coast Pedal Boards we wanted to build a website that reflected our commitment to creating the hottest, most functional pedal boards and cases on the market. We found the perfect partnership with Emerger Media. They designed a custom website and a seamlessly integrated eCommerce solution that has helped West Coast Pedal Board continue to increase it’s market share. I would highly recommend Emerger Media to any business that wants an effective web and social media presence.